When a hurricane strikes it is important to have the essentials already on hand. 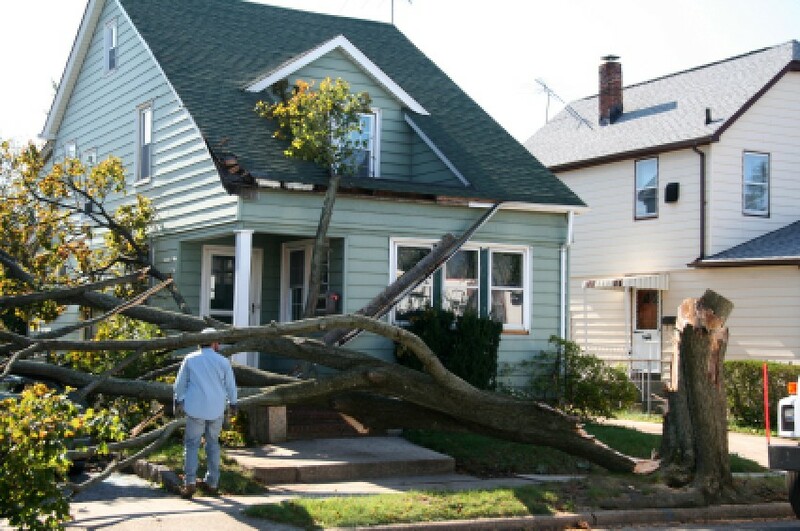 Preparing your dwelling and your family for the impending high winds and possible flooding is vital. This is a guide about preparing fora hurricane. Editor's Note: This post was submitted 9/15/2008. We hope that Diana's situation has improved significantly since submitting this. Hurricane Ike has devastated Texas, Kentucky National Guard have been deployed to assist and the Louisville, Kentucky area was hit by Hurricane force winds Sunday afternoon leaving a trail of downed trees, wrecked homes, power outages and devastation. Our entire city is currently without power, no gas stations are open and trees are across all roads leading from my house. I don't have electricity, telephone service or reliable cell phone service at my home. But we are safe and relatively happy. Always refill your cars gas tank when it gets between 1/2 to 1/4 full. Keep your cell phone recharged. KNOW where your emergency supplies are kept (we keep all our flashlights in one closet). 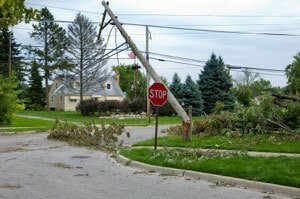 NEVER approach downed power lines. Call your provider and report downed lines as soon as you are safely able to do so. Downed tree limbs can be deadly. Limbs can fall unexpectedly, chain saws are dangerous. IF you are inexperienced proceed with extreme caution! Paying to have limbs removed is cheaper than the hospital bill that results from you trying to do it yourself. NEVER use a gas or charcoal grill inside your home. Report any damages to your homeowners insurance. Take photos of damage. Remember that losing the contents of that basement freezer can result in a paid claim. Consider purchasing a gas generator if you live in areas prone to power outages. This can preserve your refrigerator contents and allow you to make a pot of coffee or use the microwave. If you have a gas generator be sure to know how to use it properly and keep gas, in an approved container, handy. Don't use the generator indoors. RELAX, Take a nap or use this time to play games with your kids, take a walk (if it is safe to do so), pickup small sticks and limbs for a bonfire later in the season (make a game out of cleaning up your yard), reconnect with your neighbors, lend a hand to a less fortunate neighbor or an elderly person in your neighborhood. Share your chainsaw or power tool skills and lastly count your blessings. Each year preparing for hurricane season, I fill plastic containers (ice cream buckets, milk jugs), with water to freeze. Should we lose power, the ice can be used to refrigerate food and drinks while the other containers help keep the freezer cold. Remember a full freezer keeps cold the longest. 2. Make a copy of ALL Important papers and store them on a CD. Include your SS card, insurance papers, and birth certificates. If you have the fingerprints of your kids, store those images as well. Put it in a safe place (car glove box?) and grab it if you have to leave in a hurry. 3. Make sure you have batteries recharged. 4. When ever you go to bed make sure you have a pair of shoes handy (We live in a tornado area and if we have to head for the basement we know we can slip into a pair of shoes easily. 5. Keep some cash on hand in a safe place (we keep at lease $50-100 in a safe but accessible place) It might be worthwhile to store it with the CD of your important papers. 6. Don't run out of staples like bottled water, diapers, and canned soups. I always make sure I have a pantry stocked in the event of an emergency. 7. Put stuff where it belongs (can opener, dog leash, car keys, mobile phone). That way in an emergency you can react and not lose precious minutes if you have to move quickly. 8. Make everyone responsible for something ahead of time so you don't waste precious minutes making decisions that could cost you your life. 9. Lastly, remember is it only STUFF and it is replaceable. Your lives are the only real things worth saving. Preparing for hurricanes. The only good thing about hurricanes is that there is a warning and time to get prepared. I moved to RI in 1953. In '54 we were hit with Carol. My last hurricane (so far) was Bob in 1991. Having just survived Hurricane Dolly, I discovered a couple of things we should do to be prepared if we have to evacuate. We have had a couple readers write in because they are concerned about preparing for hurricane season this year. They are low income so do not have the money to go out and buy a lot. If you have any tips on how to prepare for what could be an active hurricane season, please share them below. Ideas that are inexpensive would be most welcomed. One of THE most cost effective ways to prepare for disaster is to assemble emergency supplies NOW -- don't wait. There are lots of lists on line. American Red Cross has one. Get water and food first (and a can opener), then work on the rest as you can afford it. AND -- keep your gas tank 3/4 full of gas. In an emergency, you won't have to pay the elevated prices. i am trying to get prepared for any of these many disasters THEY SAY ARE coming. i have face masks, latex gloves, water in bottles from the spigot. i am preparing my home for not using the air conditioning because of rising costs for electric. blocking windows from sun and making it ok to open windows. that would all come in handy if i lost electric also. I have to agree that the cheapest thing to do is buy at least some supplies ahead of time, when they're on SALE. Most grocery stores & mass retailers have very cheap, generic, gallon-sized drinking water that you can get. To save more, ask if you can buy a case for a good price. (This water is just as good as the name-brands, usually.) Water is the most important thing to have. Then buy a box full of fortified breakfast bars on sale for some emergency food. For cheap, all-night light, grab a twin-pack of lightsticks (the kind you break & shake to light up) at your local Wal-Mart or Target. They both carry these. One of those will last you all the dark hours of the night, and two should have you set in most hurricanes. Then you don't have to waste expensive battery life on your flashlight or run a fire risk with candles. Plus they're highly portable--you can take them anywhere, they're cool to the touch & perfectly safe. Put your food & light sticks & other essentials (medicine, phone numbers, travel sizes & free samples of toiletries, first aid kit, diapers, etc.) in a small duffel bag, or if you don't have one, an extra pillowcase, so it's ready to go. If you live in a very high risk area and might need plywood, see if there's a second-hand building supply retailer near you. In our area, we have a store that sells leftover materials from Habitat for Humanity. It's less expensive. If you wait till hurricane time, the prices of plywood skyrocket. You could also see if a local construction site has scrap plywood they'll give you. Finally, call someone you know--ahead of time--who lives farther inland/on higher ground to see if you (and your pets?) can go stay with them in the event of a hurricane evacuation. Then if you're ordered to evacuate, leave the minute they tell you to and go to your friend's place. Then you aren't stuck paying for an expensive hotel room or forced to go to the local free shelter. But whatever you do, evacuate if told to. Whether you have to evacuate or not, bring in or tie down everything that can become airborne during a hurricane. If you're on a tight budget, the last thing you need is a broken window or medical bill from that flying lawn chair. Hope this helps! My family and I have been through a couple of very bad hurricanes and the best suggestion is to check out the available shelters before hurricane season. It doesn't do any good to prepare your supplies and head to a shelter when the shelter is nearly destroyed around you. Please do not go to a shelter that has never been through a hurrricane. We went to a brand new shelter in a safe area during Ivan and the roof lifted up and the whole shelter ended up flooded. One other thing if your area is hit but a hurricane everyone needs to be nice! It will be hard driving without major lights and trees on the road so slow down and give way and be nice. There are several inexpensive solutions to hurricane preparedness, but by all means start now. I live on the gulf coast and the best way I have found to prepare inexpensively is to fill clean empty plastic jugs with water from home. These can be empty 2 liter soda bottles to gallon milk jugs. (You can also keep them in your freezer to take up empty room.) Water is good in plastic for 6 months. Another thing is I keep my old linens in a "disaster" box instead of throwing them out. If you go to a shelter you should be prepared to care for your own family if possible, so old sheets, towels and blankets are very handy. As for the canned food, every January I start to stock my supply, one or two items a week. The American Red Cross is an excellent resource, so is your local office of emergency management. I went through Hurricane Hugo in 1989 we were the bull's eye for the storm.I thought I was going to die, it was so horrible. My advice... Listen to all newscasts. Do what officials want you to do. And here in Charleston since we are a coastal community they always have hurricane preparedness brochures in stores. Just stay alert! which also sells military surplus and survival gear. There are also some archived tips of the week. Water is the best in that situation, and what I do for my family is after we finish milk/juice I clean it out and fill with water (from the tap, better than nothing!) and I freeze it. We have a chest freezer, and I line it with these bottles. I use smaller bottles in the regular freezer. That way your food also stays colder longer, or you have "ice blocks" for the cooler! Refill any medications before they run out, and save the 2-3 week supply for your emergency kit. Even if you always keep your regular meds with you, those extra will come in handy when the pharmacies (and records) aren't available...just keep in original container! Buy enough "meals" to last one week, if you can't afford a lot. It's better to have a little bit of food that is good than alot that you won't eat or can't use. And please, pack coffee or cocoa, some kind of easy treat! Times like that (being uprooted) are when you need your comfort foods! American Red Cross (local chapters) and your county government sites are great to check out for emergency preparedness updates and nearest shelters (some have search engines that automatically tell you the closest.) Have a communication plan and someone out of state to contact. Also (thinking of my family in Tampa...) just save your money and buy what you can now, even if you have to put off things like movies and dining out for a month or two. You may be depending on these things for a month or two, so don't wait until the mobs start! Rotate your food supply to get used to the taste and keep it fresh. Note: Mountain House brand meals are great for carrying (we use them for hiking) and epicenter.com has a great deal on a case.....they are not bad either! If you don't have a place to store the trash can, buy an inexpensive "accent table" top and tablecloth, and you have a new accent table. If you have to evacuate, you may or may not be able to fit the trash can in your car, but you can unload it at that point--but at least everything will be together in one spot. Don't forget to "rotate" the food in there at least once a year--use the old and replace it. The same with any batteries or other things that might be "perishable". If you have family photos or heirlooms, you might want to invest in some sturdy plastic storage containers for them; or several tarps--so you can move these pieces to the safest area of your home and cover them well with the tarps, just in case. THIS IS NOT A COMPLETE LIST AND CAN BE ADAPTED TO INDIVIDUAL FAMILY NEEDS. HAVE THE PACKS PREPARED AND READY IF YOU ARE REQUIRED TO EVACUATE YOUR HOME FOR ANY REASON. YOU CAN GRAB AND GO. IF EVACUATION BECOMES NECESSARY, USE A PERMANENT MARKER AND WRITE FIRST AND LAST NAME AND A PREVIOUSLY DECIDED UPON OUT-OF-AREA CONTACT PHONE NUMBER ON THE INSIDE FOREARM OF EACH FAMILY MEMBER. NAME AND NUMBERS ON THE PACKS TOO. A 72-HOUR PACK IS GOOD PREPARATION FOR EVERYONE AS DISASTERS CAN HAPPEN ANYWHERE. DON'T SPEND A TON OF MONEY- USE WHAT YOU HAVE IN YOUR HOME. MAKE AN EVENING OF IT AND INVOLVE THE WHOLE FAMILY IN THE PREPARATION. Important Photographs and papers. Should never be kept in your home, They should be in a bank safety deposit box. Today it is easy to scan and copy your photos and store them on a CD-Rom. you can do the same with your important papers. That way if a disaster hits your home,all you have lost is just the CD-Roms. How many times have you heard home owners saying the same thing about their treasured photos being lost.. Do something TODAY. The cost of that Safety Deposit box? A Trifull when you consider the agony of the loss of all those momentos.INSURANCE CAN NEVER REPLACE THEM. Take a Shower, leave the water in the tub to scoop out to flush the toilet with or put a wash tub in the shower and stand in it to shower. I usually also tell them to put a bucket of water in their tubs for flushing too and save it for Nasties, not just a little piddle. A person will seldom regret getting clean before a long power outtage. Keep a squirt bottle or 2 of water in kitchens and bathroom for hands and personal areas. When in bathroom squirt these areas over the toilet to dilute a little piddle. Don't jump if the water is cold. Watch out for snakes and fire ants. Both of which tend to come up out of the ground when there's a heavy rain. When you buy flashlights and batteries it is wise to get extra bulbs as well. Don't forget the emery boards to go with the batteries, you can often get more life out of the batteries by using the emery boards on the ends. Grab a battery operated TV, it really helps to see the outside world. I know during IVAN last year it was one hint of Normal Life. The Black & white ones cost about $20 so are certainly affordable and usually have am/fm radios too. Lots of hints gathered in 50 years or so. But Nobody is "Prepared" for the Big Ones. They scare the Bleep out of you, period plain and simple.